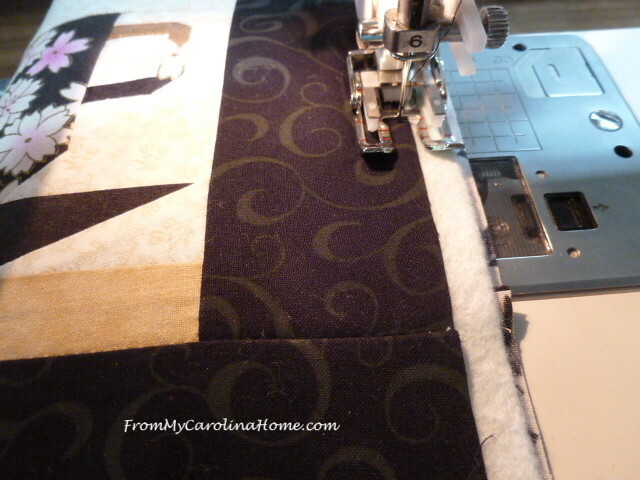 Finishing up the candle mat from last week, I did the quilting on my domestic machine. 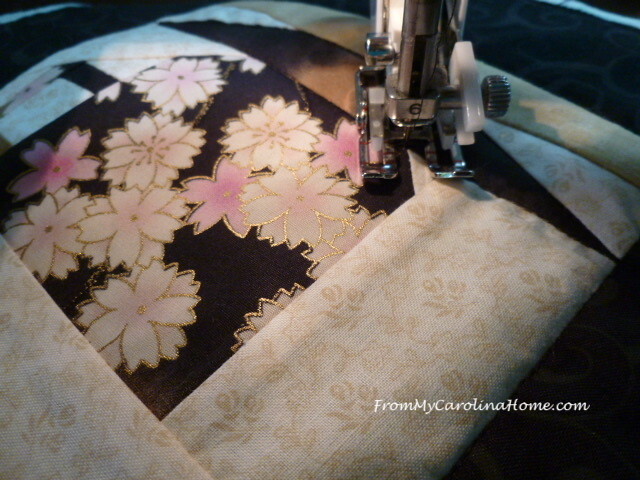 Beginning the quilting, the edge was stitched all the way around. Note that I am using a walking foot for this. 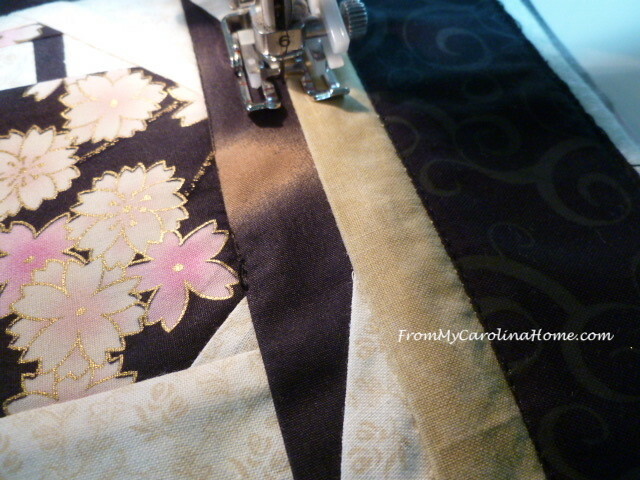 Next, stitching in the ditch all the way around the paper pieced section. Then, I wanted to stitch in the ditch around the teacup and saucer. If I start here, then I’ll have to tie off twice. If I start at the intersection of the cup and saucer, then I can go around both sections without stopping and starting again. So I did that, stitching in the ditch around the saucer first. Returning to the beginning point, now I can just pivot and continue stitching around the cup. 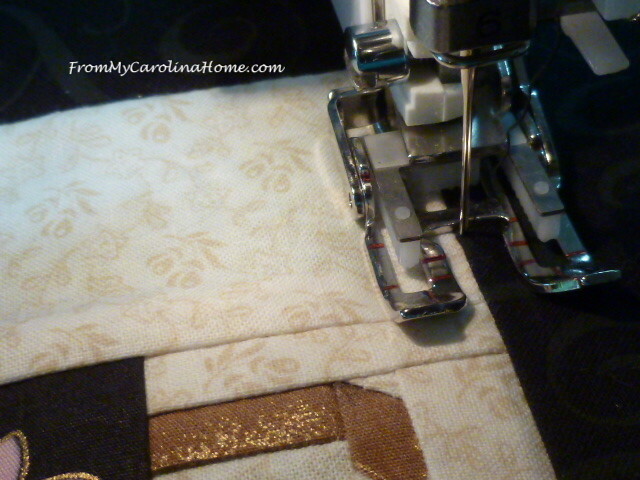 When I get to the handle, I stitch around the outside first. Then I cross the handle and move to the inside of the handle, which takes me back up to the top again. Coming straight down the cup side from there, I continue outlining the cup. All the ditch stitching done, it still looks like it needs something. I added a line of stitching in the middle of the borders, crossing the lines in the corners to make a bit of a frame effect. It still looked unfinished to me. So, I put a hopping foot on the machine, and did some free motion stippling in the background to make the teacup pop a bit more. I don’t do this often enough, but I did get into a rhythm after a bit. I still crossed some lines, but I am sure the quilt police won’t be making an inspection anytime soon. Binding is added in the same black print. 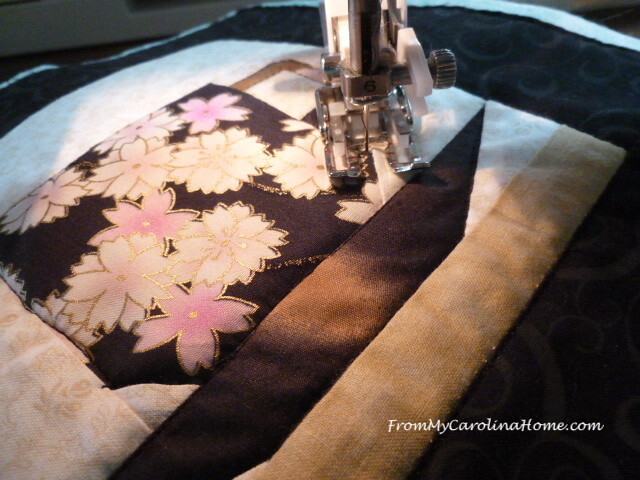 Fold to the back, and machine stitch. Texture around the teacup looks nice, so this is done! The response to the idea of a teacup of the month quilt along was very positive! So, I am game to do a monthly quilt along, using mixed techniques, with the goal of having 12 teacup blocks done by next summer. One thing, I plan to use different sizes of teacups, some will be 12-inch, some 8-inch, maybe 6-inch too, so I can have a variable block quilt at the end. 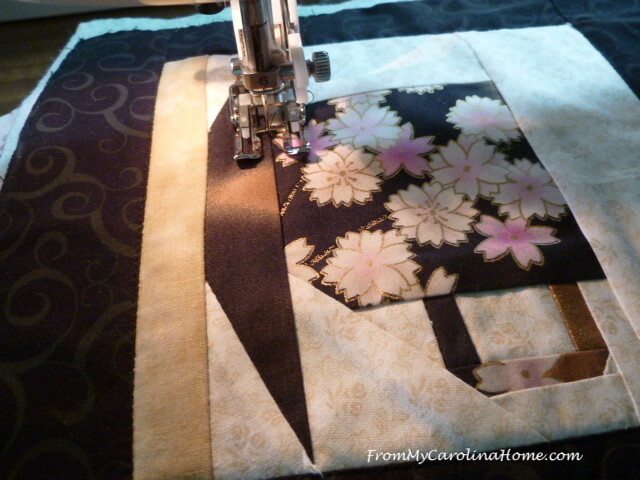 If I have spaces to fill, a little section of flying geese, or just a patch of pretty fabric may fill in the spot. I do not have this designed yet, but I’ve been noodling around in EQ8 a bit, and here is an idea of what I have in mind. This isn’t the final design, but it will give you an idea. There probably will be fewer teapots, but I do plan to have one or two. I’ll be doing several from Cups and Saucers or Cups and Saucers, Updated Edition,(actually the same patterns, just one is updated – affiliate links), if you want to do the same ones. If you are a beginner at paper piecing, the book Show Me How To Paper Piece by Carol Doak is a great resource to add to your library. For the foundation paper, you can use lightweight newsprint papers, June Taylor Perfect Foundation Papers, or Carol Doak’s Foundation Papers. You need something lighter weight than regular copy paper, and the translucent papers are easier to work with as you can see the fabrics underneath easier. The best thing about the sheets is they fit in your printer, so you don’t have to trace the patterns. I’ll also be doing some links to free patterns on the internet for paper pieced and applique blocks, and also creating some for simple piecing in EQ8. Feel free to substitute any blocks for any other if you just hate a certain technique. 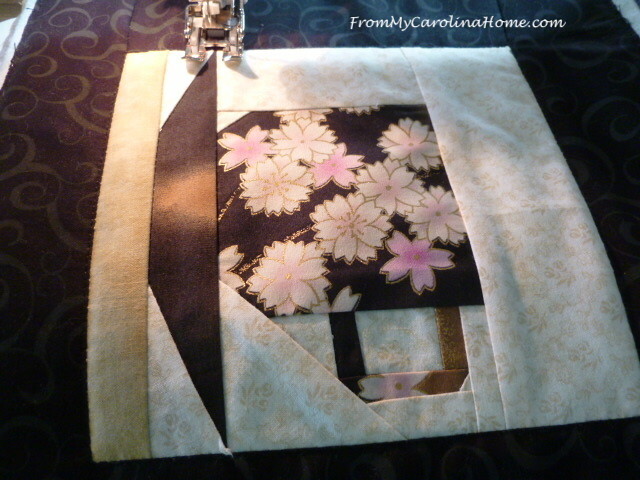 Join me for just one block for a mug rug, do a few for a table runner, or all 12 for a throw size quilt. So, how does the first Friday of each month sound? We’ll begin on August 3rd. Also, we will begin with one of my free patterns paper pieced, to give everyone time get the book if you want. No, you don’t have to buy the book, you can substitute any other block for those when we get to them. But I do plan to use some patterns from that book in the final quilt at this point. 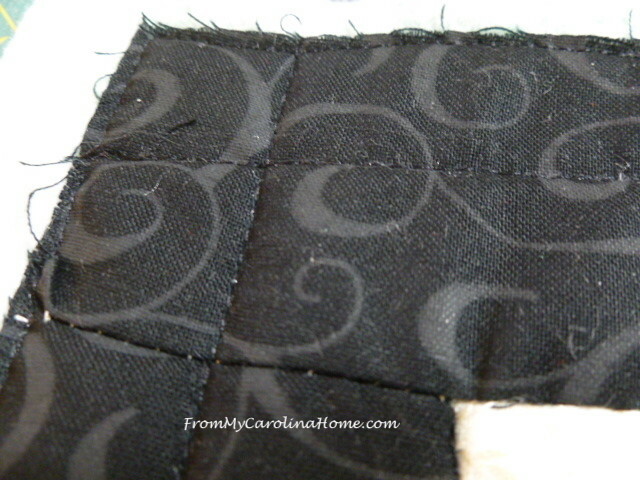 I’ll do a post on paper piecing basics with tips later this week. Here’s my tea on my teacup. Congratulations to Pamela Arbour who won the Christmas in July giveaway! 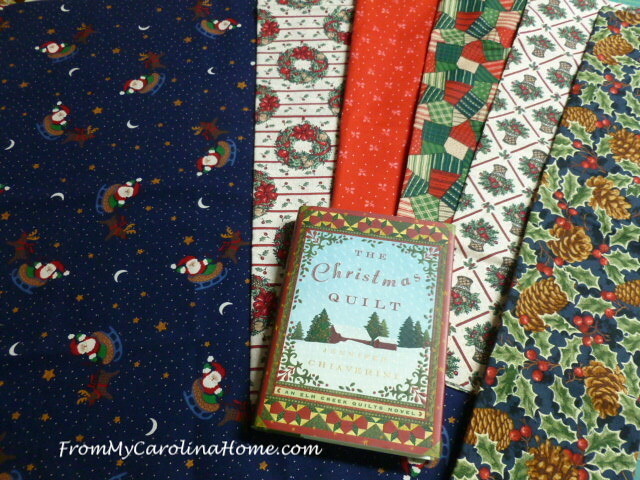 Pam will be receiving these fat quarters and wonderful book, The Christmas Quilt by Jennifer Chiaverini. This is a delightful book, if you haven’t read it, get it for your holiday reading (and it makes a great gift for a quilter). Last chance, Fat Quarter Shop’s Notion of the Month – Rotary Cutters and Blades 30% Off!! Check out today’s Flash Sale at Fat Quarter Shop. Every Craftsy Class is on Sale, through tonight, now is the time to get that class you’ve been thinking about! Start pulling fabrics, LOL!! What is your teacup theme going to be? Your candle mat turned out lovely. I like the rich colors. Nice photo! You are beautiful! Sounds like fun…look forward to it. And love your picture too! 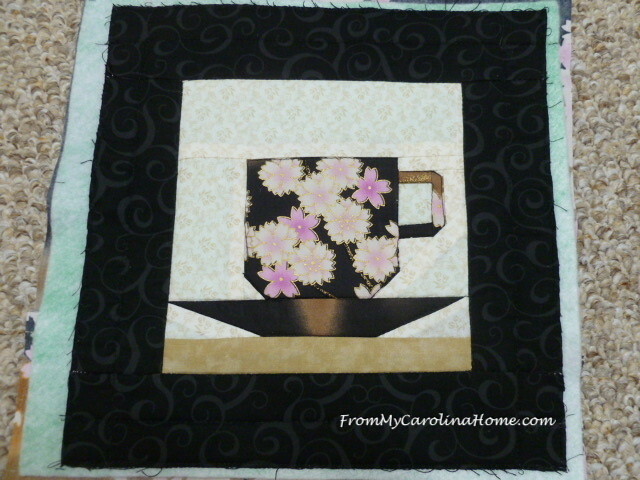 I have a couple different fabrics with tea cups on them…maybe a couple blocks could be fussy cut for my project. We’ll see. 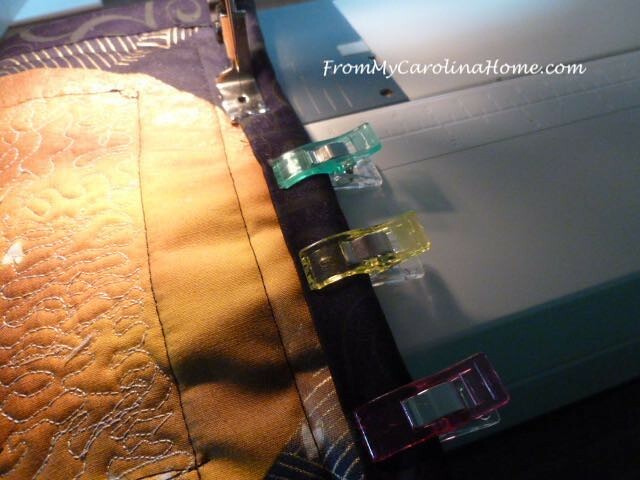 I did wonder what size binding you use on a smaller block like that—2-1/2 inch or smaller? It looks so nice! Cute idea – I’ve been wanting to do a teacup/pot something, just never got around to it. What about the teapot in the center, cups all around? Hard to pick a favorite teapot tho!! Tanks! That is a really good photo with Scrap Dance and the other creations surrounding you. Lovely. Thanks to DH! Have fun designing, can’t wait to see what your final pattern looks like! The candle mat looks great, as does your photo! I loved reading Jennifer Chiaverini’s quilt series. 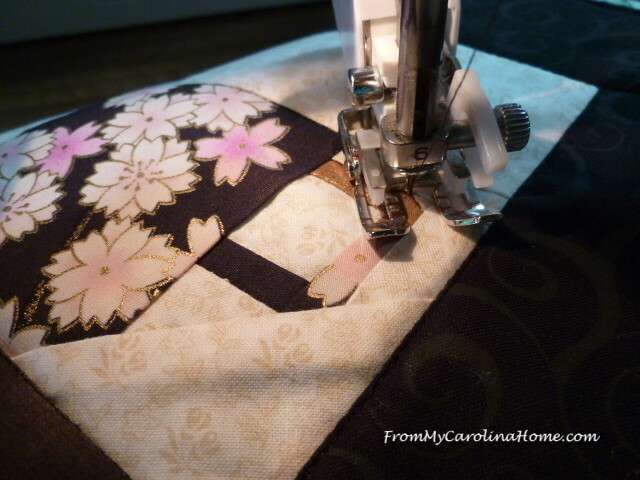 Maybe that’s when my quilting seed germinated. 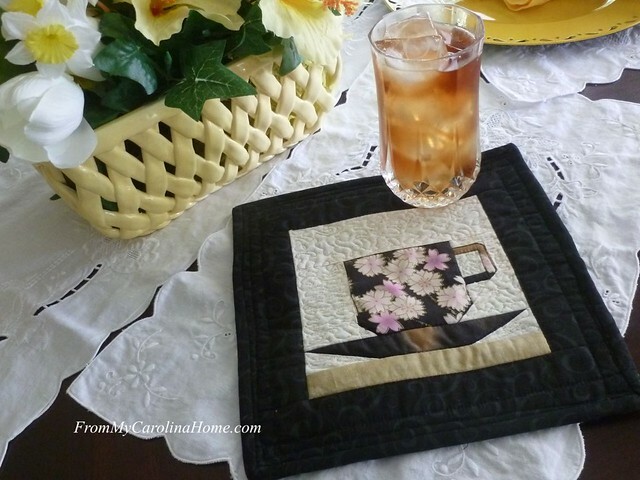 Your quilted candle mat/mug rug looks great – so does your sidebar photo! Hello Carole; Heck yeah, I am definitely in! This sounds like a great learning experience along the way, plus just a whole lot of fabric fun creating each one of the blocks you are going to be choosing. Your new picture is lovely! I think that you chose a great photo that shows your personality perfectly! Have a fabulous day! Love this Teacup Map, what a precious item to share with friends. You look fabulous in your photo! I can’t get over how much you look like a friend of mine from Maryland who recently moved to Charlotte, NC. Thank you for joining us at T Stands For Tuesday. 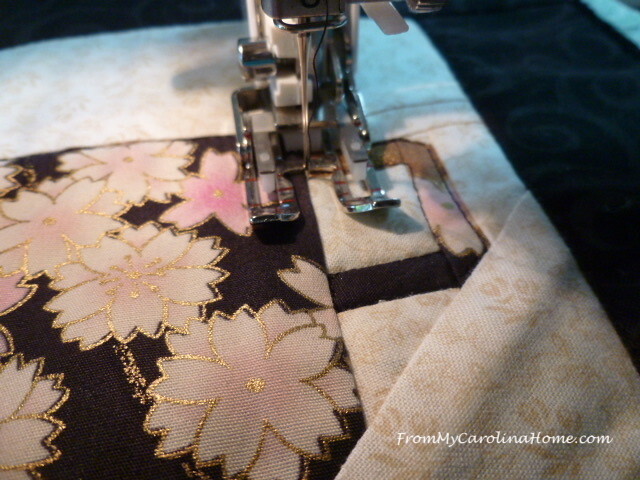 I don’t really sew, I just mostly sew paper to paper and never use a pattern, since I don’t have any cutting tools. I also don’t have feed dogs that drop, so could never do free motion quilting. However, your awesome tea cup and saucer are stunning. i’m truly in LOVE with the finished piece. Sounds like others will be joining in, too. I hope you will share what you make each month with us at T, also. I do NOT use my e-mail, so would NEVER read anything you wrote. I use my blog to make and read comments and answer comments on others’ blogs. But we are truly delighted you joined us today at T Stands For Tuesday. Well, I have never done paper piecing, but I guess it’s time to throw caution to the wind and just jump in! Sounds like a fun project. So, just to clarify, the updated Cups and Saucers book will be ok – since they have the same patterns? I will definitely grab some foundation paper also! And maybe Carol Doak’s book as well! I love tea sets and had quite a miniature collection that I’m slowly giving away! Thanks for the inspiration! This is stunning! 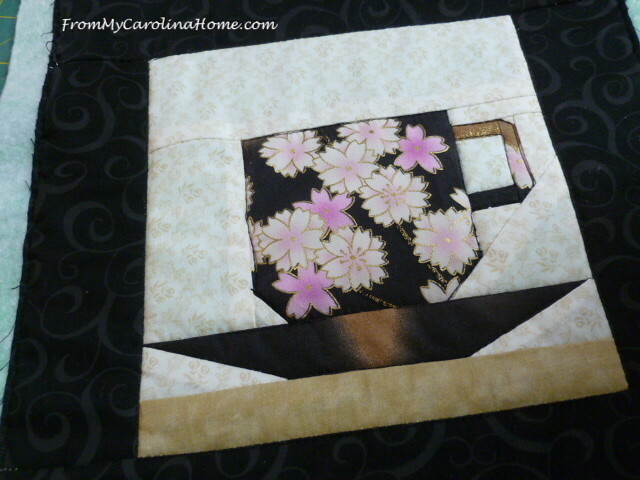 I am loving that fabric you used for the tea cup! What a wonderful idea to make one block per month. I love sewing clothes but I am not a quilter. The idea of this quilt certainly makes me want to give it a try. Thanks for sharing with us. Welcome to the T-party, Carole. What a perfect post for T-day. 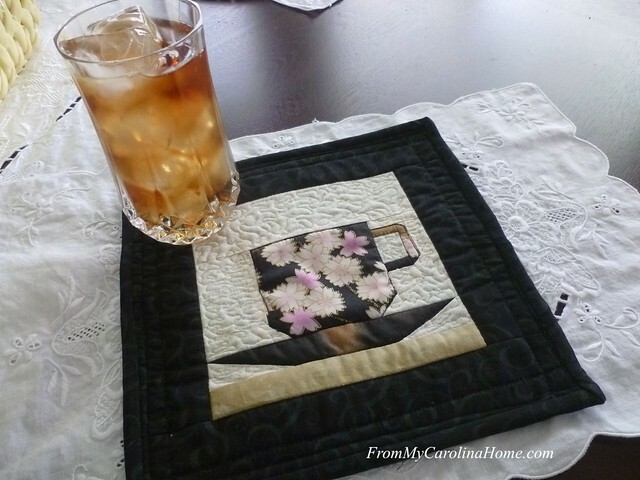 I love the quilted tea cup mat. I browsed a bit and was delighted to see all your wonderful tablescapes. My sister-in-law loved tablescaping in Wisconsin and I was always fascinated by the beautiful displays. 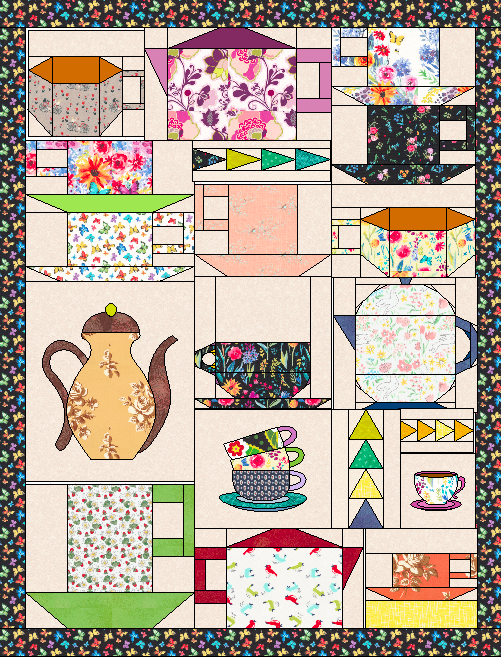 The mat’s lovely, and a teacup of the month quilt sounds like a fun project. Happy T Tuesday! This is a really lovely mat. 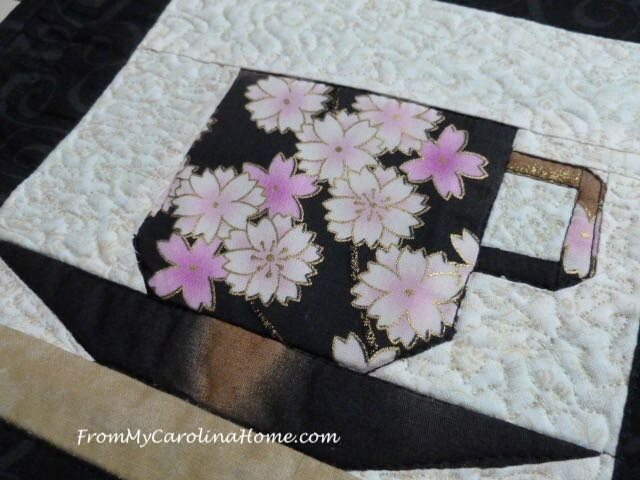 I’m a great fan of small quilted mats, they have so many uses. 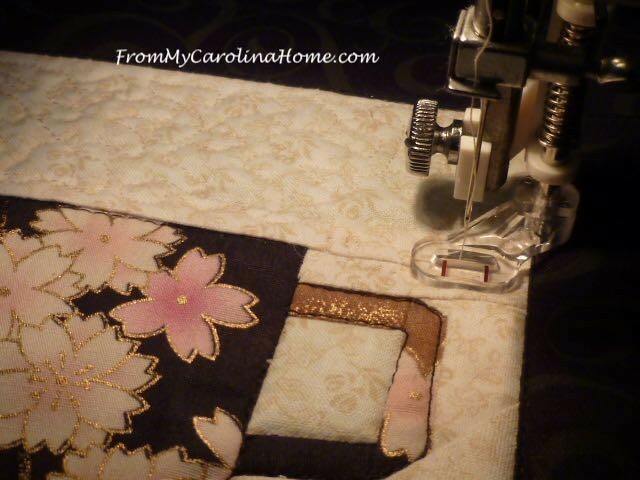 The stipple quilting did make a difference and completed ithe mat beautifully. I was very interested to read the steps and see them illustrated. Looks like your proposed large Tea Quilt will be marvellous too. This is an amazing project and a wonderful design. Its good to meet you at T Stands for Tuesdays. 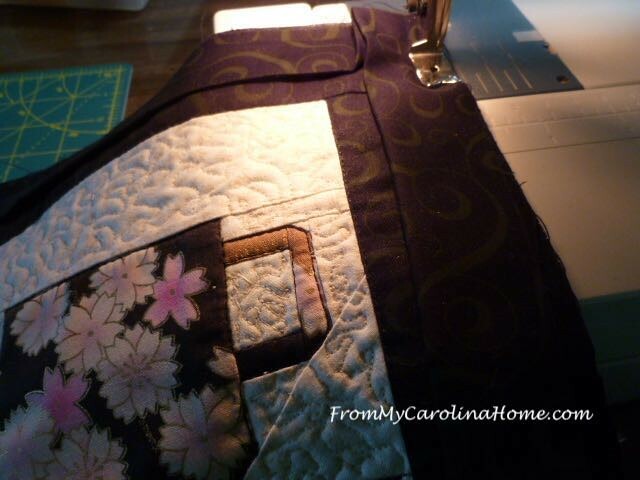 This is a lovely finish with your quilting. bravo!! your tea mat turned out perfect! Well done you! It’s perfect! I’m glad you shared this at T for Tuesday. I have an odd less than fat quarter of a blue silky oriental, I think I will choose one of the teacups to make a small table topper with it!